L-R: Brendan McGee, Eamon Deane, Steve Owens, Pinta Quigley. Behind every great fighter, there’s an even better coach, and Derry native Daniel ‘Pinta’ Quigley naturally happens to be both. Pinta is the first Irishman to hold the prestigious “ISKA” World Heavyweight Professional Kickboxing title – one of the most sought after belts in the world. 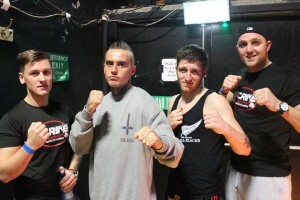 As well as being a professional fighter, Pinta finds himself coaching some of Ireland’s most promising young fighters, including Eamon Deane and Steve Owens, in his gym Strike Martial Arts Academy. We caught up with Pinta after the fight to find out what it’s like seeing week’s of training finally pay off in the ring. So Pinta, what made you become a fighter? I have always been physically active and I come from a sporting family. I started kickboxing at a late age of 18 to keep fit and to try something new. After a few months of pad work I got curious to see how it felt to apply what I was learning, so I decided to take part in my first fight and it all started from there. What is the best fight you’ve ever had? I enjoy all my fights. I enjoy the training and preparation leading up to them and respect the fact that my opponent has done the same. I feel very fortunate for all my title opportunities. The one fight that sticks out was my pro-heavyweight world kickboxing title against Paccome Assi in my hometown Derry four years ago. It was my toughest fight and we stood toe to toe for 12 full rounds. How do you prepare for a fight? A mixture of cardio exercises such as pad work, sparring and sprints. I also add in some resistance work. It is not only physical preparations, you also need to concentrate mentally, so I read positive quotes and keep my mind focused on my goals. That’s all I’m saying because it’s classified information between my coach and I (begins to laugh). What would you say to encourage people to become fighters? If you want to become a fighter then you need to have the dedication that is required. Be willing to push yourself to the limit and although it sounds selfish, always put your fighting career above anything else. The ring can be a very lonely place so if you are not willing to make sacrifices and train then you have no business being in a ring. What made you set up Strike Martial Arts Academy? I think if you have success at anything then it’s always important to give back to it. In Derry there is a lot of fighting talent and I wanted to pass on the experiences I have learned over the years. It is not all about the fighting, people use Strike as a way of keeping fit or for weight management. Within the club, there’s a great atmosphere and it has its social benefits. I am from a personal trainer/fitness background so it makes sense to use my kickboxing history as a way of promoting health and fitness. Through kickboxing you are not only keeping fit but learning a new skill, self defence and self discipline. Why do you like being a coach? There is something very rewarding about watching a raw novice walking through the doors of the gym, overcome with nervous energy and watching their journey over the next few weeks, months and years as they take on board the things you are teaching them. How do you feel when your fighters are in the ring? When a fighter steps in to the ring, not only are they representing themselves, but they are also representing me and my club so I always want to ensure I am 100% confident they are ready. I think I am usually more nervous for their fights than I am for my own, but it’s just down to me wanting the best for them. As long as I know they are listening then I am confident. Every fighter has their own unique skills and way of fighting. I enjoy identifying what they are and then watching them use them skills to grind out a victory. What’s the next big fight for you? I was due to fight in Oklahoma USA on the 1st of November, but due to issues out of my control it was rescheduled until February. I am eager to get back in and we have a few offers on the table so I’m sure it will be soon enough. How does it feel to be so successful in the fighting world? I have trained and worked hard to get to where I am, but there is always another level, so I need to keep working away and keep my feet on the ground. I know where I want to be so it’s down to me to achieve that goal. Maybe when I retire I will reflect back on my career and I will find it easier to answer that question, but for now as long as I can keep moving forward and keep making my family proud then I am happy.